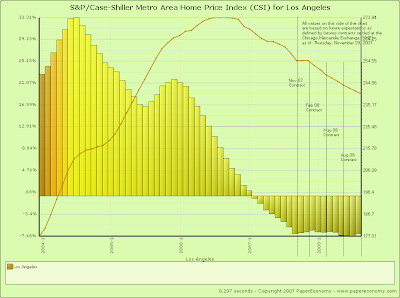 7% reduction in OC home prices - Priceless. Shaving roughly $40K off the price of the typical OC home - Priceless. Saving nearly $100,000 in PIT over the life of a 30-year loan - Priceless. For increasingly cheaper housing there's the implosion of the OC RE Market, for everything else there's MasterCard. Regular readers will recognize this format of chart as being sourced from our friends at http://www.paperdinero.com/. The chart shows the S&P Case-Shiller price index for by month for the last few years as well as the monthly predicted index value as derived from futures prices traded on the index. The line of demarcation between historic values and predicted value is the left-most of the vertical dashed lines on the right-hand side of the chart. This chart is pretty easy to understand given that each of the predicted values is at roughly -7%. That means for the futures market expects prices to be off 7% on a year-on-year basis at least for the next 12 months. At the current price of $570,000 for the typical OC home, an additional 7% off would mean a savings of a whopping $40,000. Personally, I think we may be looking at more than 7% YOY. Particularly post-May next year, when the resets hit in mass, I think -10% YOY is rather likely. Regardless, if the decline in price is only 7% and that keeps me from paying roughly $100,000 in principal, interest and taxes over the life of a 30-year loan, I guess I can live with that.